www.searchingforreason.net : Breaking: Mass. House repeals archaic abortion law. Tricia Wajda, Planned Parenthood Advocacy Fund. Breaking: Mass. House repeals archaic abortion law. Tricia Wajda, Planned Parenthood Advocacy Fund. 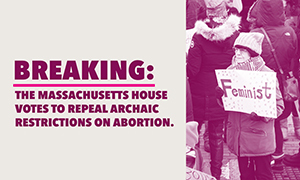 Exciting news – just moments ago, the Massachusetts House of Representatives voted overwhelmingly to wipe archaic, unconstitutional laws off the books and make clear the right to safe, legal abortion is protected in our state. These outdated laws represent a Massachusetts that no longer exists – one in which women did not have autonomy over their bodies, futures, or lives – and one that should never again exist. Share the important news on Facebook: Massachusetts is protecting abortion access – no matter what. Known as the NASTY Women bill, this legislation repeals outdated statutes like bans on abortion and the “prohibition of contraception for unmarried people.” These laws were written at times in history when women were second class citizens and they have no place in the year 2018. Nationally, reproductive rights are under attack. The nomination of Brett Kavanaugh to the U.S. Supreme Court has put the right to access abortion safely and legally in this country on the line. As anti-abortion politicians in other states prepare for their chance to make abortion access illegal, Massachusetts is saying loud and clear that it values reproductive rights and the ability of all people to make their own decisions about their bodies. At a time when our health and our rights are under attack across the country, spread the word that we will continue to move forward in Massachusetts. By passing the NASTY Women bill, the Massachusetts House of Representatives sends a clear message that restricting abortion and birth control access should be a thing of the past, and won’t be our future. P.S. Interested in taking action to stop Trump's Supreme Court nominee? Here are four ways you can protect abortion access and stop Brett Kavanaugh.